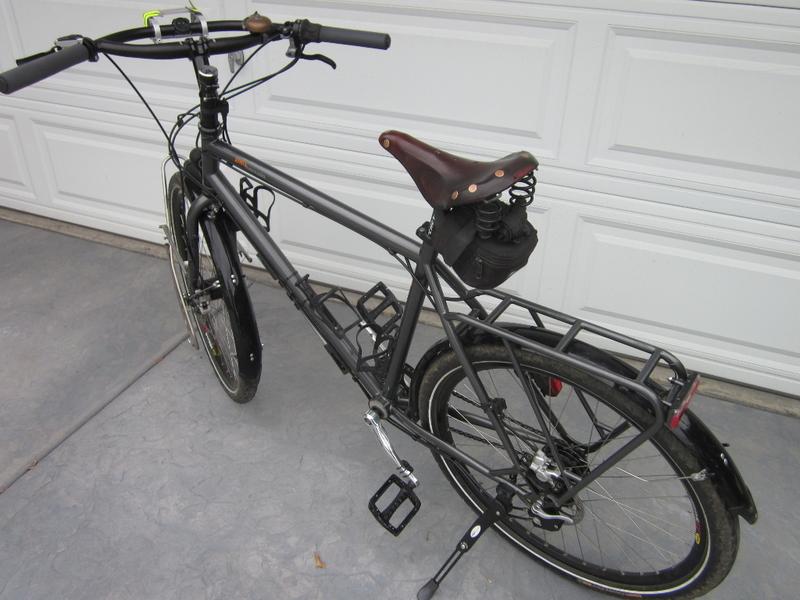 I just bought this bike on ebay from a seller in Cambridge, Massachusetts. It’s a German made Tout Terrain Metropolitan. Sold primarily as a top end city bike, it has a built in rear rack, Rohloff internally geared hub and Shimano hydraulic disk brakes. I’ve had a few teething problems. The front wheel has a slow leak. I need to bleed the front brakes. I also needed to move all my favorite components onto it. The Jones Bars, the B&M IQ-X, front pannier rack, pedals and of course my well worn Brooks Flite saddle. 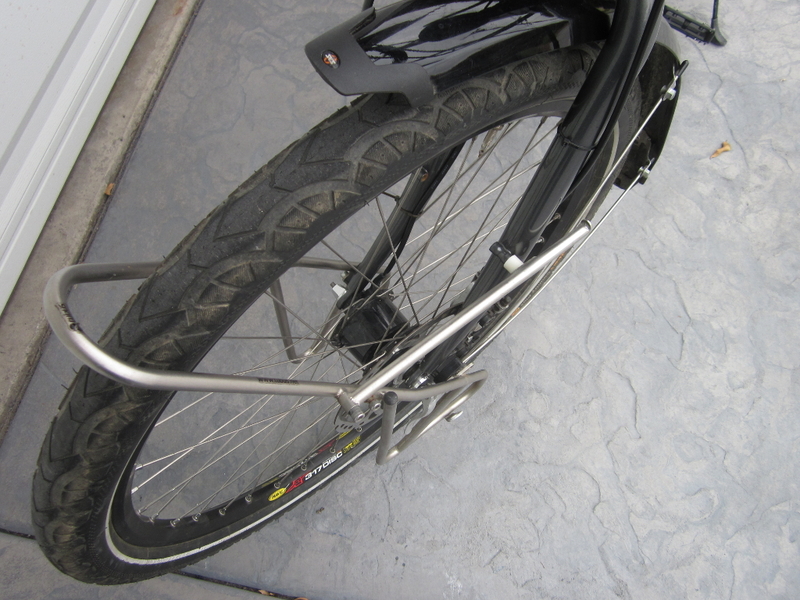 One of the nice features of this bike, is that the rear rack is built in. 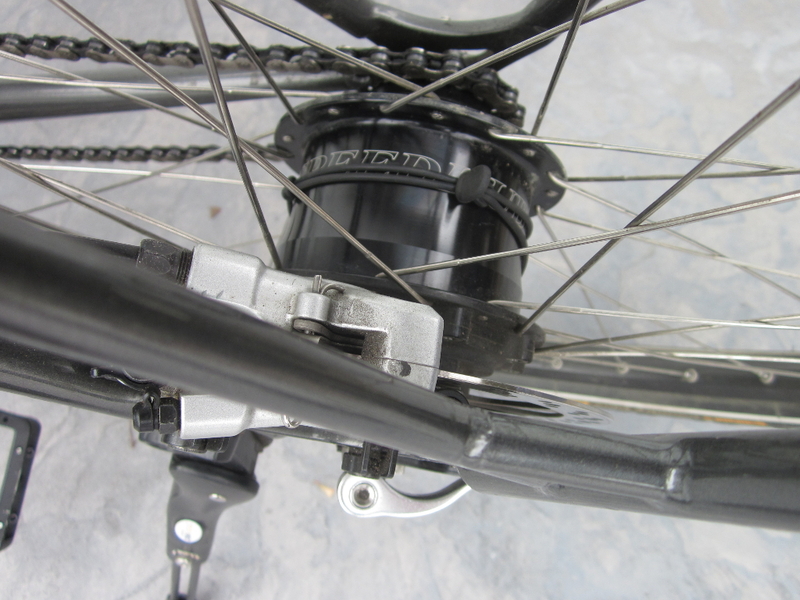 Close up of the Rohloff hub and rear disk. In the background you can see the kick stand with has it’s own mounting plate on this bike. I had to extend my Garmin speed sensor using two rubber bands from the kit. 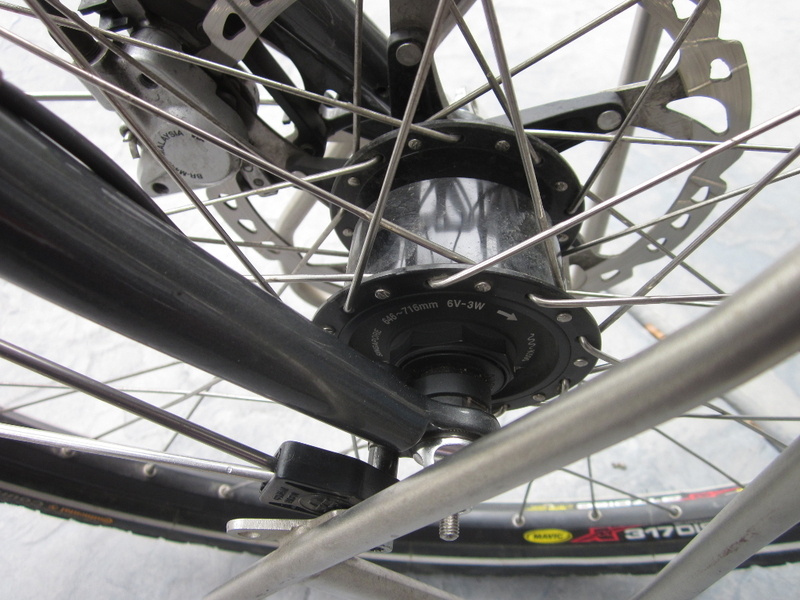 The Rohloff is quite a bit bigger than a regular bicycle hub. I really like the Jones bars. They have extra long grips (8-12 inches). Also the loop gives me extra places to mount my gear. 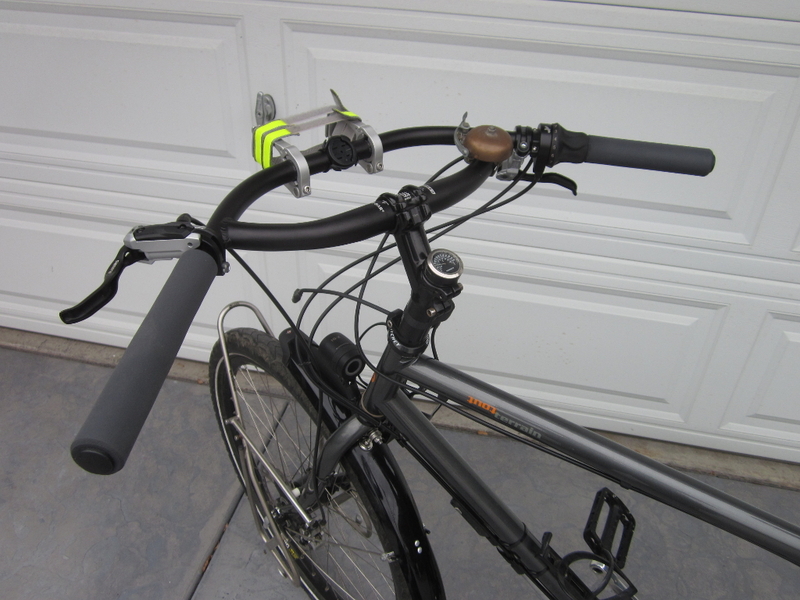 You can see the Garmin mount in the middle and the handle bar bag mounts with ankle straps wrapped around them. I think I’m going to move the bell, and I also want to mount a Cateye computer as a backup to the Garmin. That’s a stainless steel Tubus Ergo rack. They don’t make it in stainless steel anymore. It’s kind of a pain for opening the skewer when you need to dismount the front tire. But it is quite strong, and as long as I get the bottom hook in, the bags don’t move a bit. It’s yet to be seen how the bike handles with a full load. At some later date I may upgrade this, but it seems to work just fine. This view gives an idea how tight things are around the front hub. This is the brightest dynamo headlight made at this time. 100 LUX. When I ride down my street the beam spread is from curb to curb. Best light I’ve ever had. 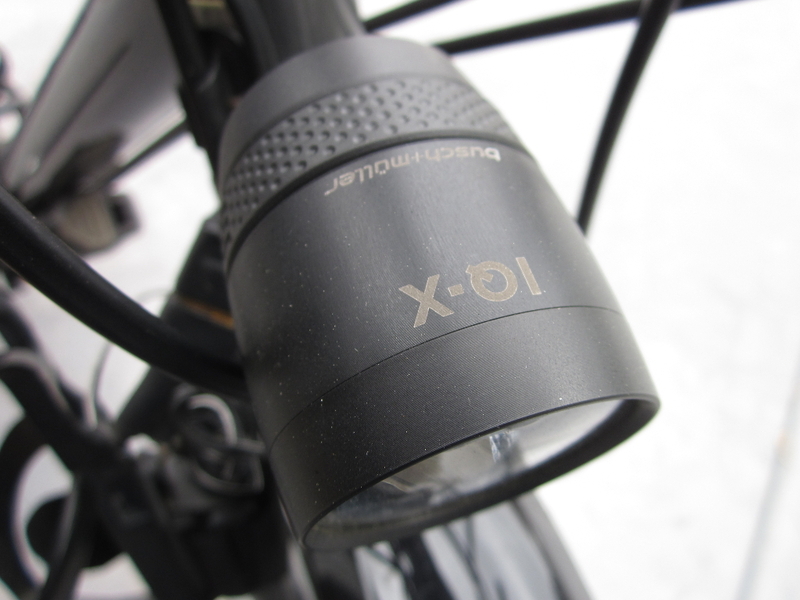 Also has daytime running light. 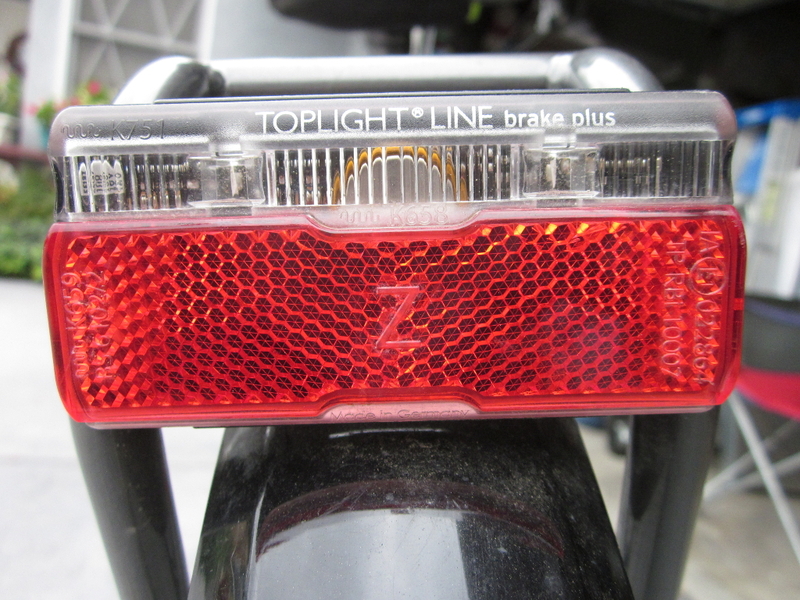 Don’t know exactly how this works, but when you brake it gets brighter, like car tail lights. There is no connection to the brakes, so it must detect the rapid change in the pulses from the dynamo. I’ve tried a lot of different pedals. 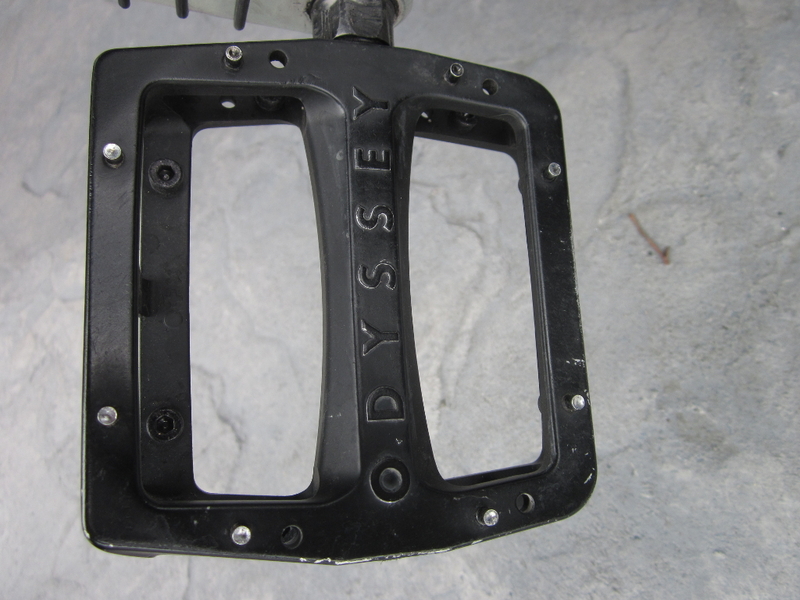 These are actually alloy BMX pedals. I’ve learned that clipless pedals cause me pain in my knees. Being free to move my foot fore and aft while pedaling helps me ride longer because I use different muscles.